EMS – known from the „ZDF Fernsehgarten“ and many other TV shows – play German hits and the current international charts. They present their own productions and other titles on a very special way! Parodies of famous pop artists like Amy Winehouse and Michael Jackson are part of their program as well as their popular ’70s / ’80s show, bavarian show and Après-Ski / Mallorca show. Furthermore CD-releases and performances all over Germany, Spain, Shanghai, Beijing, Austria and Switzerland make EMS an unforgettable event. A show-programme specially adapted to your event and always the newest songs, oldies, and basics for your event, like city festivals, mottoparties (Oktoberfest, Mallorca-, Après-Ski-Parties), trade show presentations, galas, company- and association parties, birthdays and weddings. On top of that EMS presented their mega hits „Cowboy und Indianer“, „Herzdame“, „Blinder Passagier“ in front of more than 30,000 fans and in countless television appearances. Besides there are again and again appearances with German and international stars such as Jürgen Drews, Peter Sebastian, Andi Borg, Die Hoehner, Howard Carpendale, Costa Cordalis and Boney M.
Always the latest hits in party, pop, disco, house and rock music with professional animation and involvement of the the audience. We create a tailor-made concept for your event and assist you from planning and organization to implementation. The perfect balance of light and sound technology guarantees unforgettable moments and great emotions. 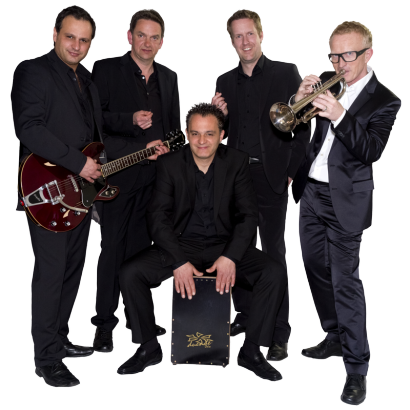 As experienced musicians and entertainers, we provide a rousing live atmosphere and creative show acts.